Along the way, she’ll teach you some of the nuances of modern pain science, healing and motor control. Once her athletes move past the rehabilitation stage, she plans an extensive return-to-play timeline, and in this book, she’ll show you examples of how to create a successful timeline for yourself. As part of the return-to-play plan, she moves from fundamental performance to fundamental advancement and finally, to advanced performance. 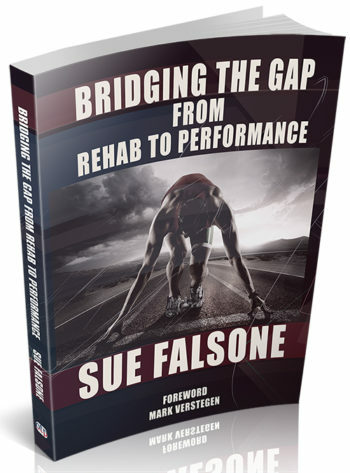 Whether you’re a clinician, a strength or skills coach or a personal trainer, you owe it to your patients and clients to understand Sue Falsone’s system of Bridging the Gap from Rehab to Performance. When an athlete is injured, where does rehabilitation end and performance training begin? Is there a line the athlete surpasses that switches us from the medical model to the performance model? The process is a continuum that takes an injured athlete from the table back to the field. The process encompasses a multitude of healthcare and sport performance professionals working in the best interest of the patient. An organizational system of progressing an athlete from injury back to sport performance is necessary to ensure no steps are missed. No part of the return-to-play process is more important than the others. All parts of the system must be addressed, at varying times, to create an athlete-centered and comprehensive program. Everything from pain reduction to biomechanics, to the sensorimotor system, to psychology, to strength training, and forward to athletic movement needs to be considered. There is no single way to accomplish the task of returning to sport, but you need an organizational system to ensure nothing is overlooked. That is why I wrote Bridging the Gap from Rehab to Performance. It is my intent to provide the fields of sports rehabilitation and sports performance with a comprehensive organizational system where “everything has its place” and every professional is welcome. This book isn’t a cookbook of exactly how to return a player to sport. It’s an organizational guide that will help you make appropriate decisions based on available evidence, patient values, and personal expertise and experience. And we do it all with the athlete’s best interest at its core. Leave your letters at the door. Let’s bridge the gap between professions; let’s bridge the gap between professionals; and let’s Bridge the Gap from Rehab to Performance. One—From the Table to the Field: Why is Bridging the Gap So Important? Bridging the Gap is 296 pages in 8.5×11 paperback format. It includes 18 original illustrations and graphics, 127 photographs, 277 references, 9 valuable appendices and is carefully indexed. Purchasing the print book via OTPbooks.com includes instant access to the ebook edition. The ebook edition includes the PDF, Kindle and epub files in both fixed and flowable formats. Bridging the Gap from Rehab to Performance? Sue Falsone is the President and Founder of Structure & Function Education and Falsone Consulting, along with being an Associate professor at A.T. Still University in the Athletic Training program. 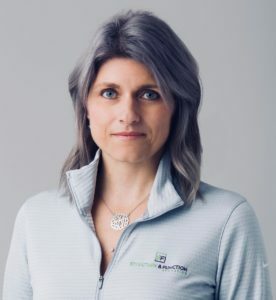 After graduate school, Sue spent 13 years at Athletes’ Performance where she began her focus on Bridging the Gap from Rehab to Performance, working closely with the performance and nutritional teams to create an integrative experience for all athletes. For over two decades, Sue has immersed herself in the culture, education, and advancement of the athletic training, physical therapy, and strength and conditioning professions. To learn Sue’s personal process and philosophy of rehabbing after injury, order your copy of Bridging the Gap from Rehab to Performance today. As a chiropractor and the IST lead for Canada’s national men’s gymnastic’s team, I found Sue’s practical knowledge described in her book very helpful managing both athletes and patients in my private practice. 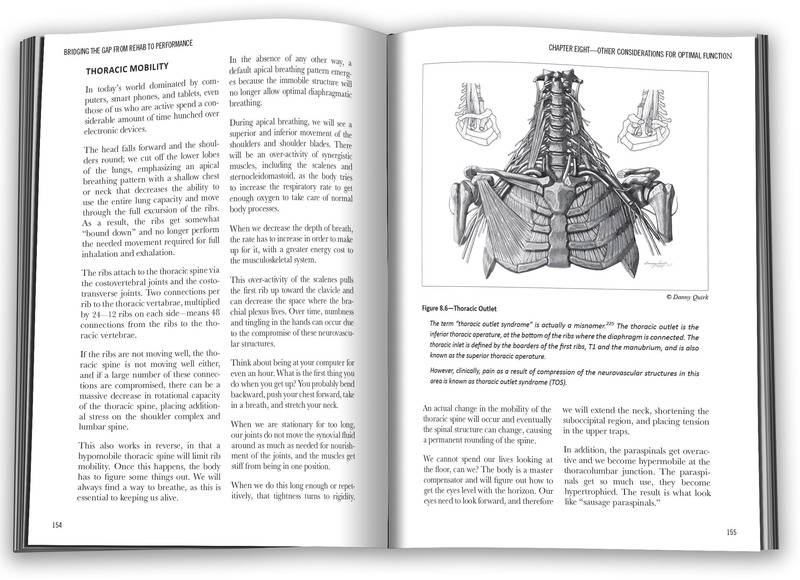 There is so much info and clinical pearls offered throughout the book, I expect to be using it as a reference to help me improve my practice for years to come. Anyone serious about enhancing their knowledge and ability to help their patients needs this book in their library! Quality information across the whole rehab to performance spectrum. Sue pulls information from a wide array of methodologies and packages them into an easy to read, actionable manual. An excellent addition to any professional library. Highly recommend to any therapist, or professional looking to dive into a different understanding of how to approach performance. I am a strength coach and a student of osteopathy. I really appreciated the clear and direct style of Sue, which is not lost too much in technicalities but gets straight to the point. A book recommended to those who train but also has to do with the post-injury path of an athlete, in its different phases. Sue has brilliantly managed to simplify the complex by providing context for so many concepts, methods and techniques across the rehab to performance spectrum. Lots of great references to further explore as well. Highly recommend! As a physical therapist who works with athletes on a daily basis, I really found Sue’s book useful and helped me improve my clinical reasoning when treating athletes. Really enjoyed this book. Very reasonable and common sense talking and explanations, also examples from practice and life. Bridging the Gap includes 18 original illustrations and graphics, 127 photographs, 277 references, 9 valuable appendices and is carefully indexed. The print book will ship from the warehouse in Kansas on the business day following your order. The ebook format will be delivered instantly via download from a digital dashboard here on OTPbooks.com as soon as your order is placed.